Kirkcaldy YM have become the first junior football club in Fife to appoint a woman coach. Charlene Lessells is part of the new management team at Denfield Park, where she will work alongside co-manager Kenny Crawford and coach Billy Blyth. And the former Spartans Ladies goalkeeper is hoping to break down the gender barriers and prove that female coaches have a place in the mens game. Charlene, aged 30, told the Press: “I’m not your typical girly girl. I build motorbikes, I ride motorbikes. “I don’t see myself as an advocate for women in men’s football. I’m just Chaz - I put on a coaching top and go out there to help the guys. “I’m lucky in that I’ve walked into several men’s dressing rooms as a female and I’ve just been approached as one of them. “I don’t think there should be any genderism in football but I get that there will be because you’ll always get people thinking it’s a man’s game. For the past three years, Charlene and Kenny have worked together at amateur outfit Bayside, turning them from alsorans into one of the top amateur sides in Fife. Now the duo hope to make a similar impact in junior football, while for Charlene the ambition is to complete her UEFA coaching badges and follow in the footsteps of Shelley Kerr, the current manager of Lowland League side Stirling University, and the only female coach in the senior mens game in Scotland. “I’ve got a 10 year plan,” Charlene explained. “I’d like to eventually take a year out of work and manage professionally for a full season. “I think there are only about eight women in total in the UK coaching in mens football. Playing women’s football is one thing, and I really enjoyed it, but that is not where my heart is at. “I’ve always wanted to coach mens football. I just enjoy helping others – my buzz comes from seeing other people develop and grow their ability. Kenny, Charlene and Billy certainly have a challenge on their hands at YM - the club has one of the youngest squads in junior football and currently sit second bottom of the South Division, the lowest tier, without a league win after 12 games. Kenny, a previous youth coach at both Dundee United and Raith Rovers, said: “It’s like being in charge of a school team. There is masses of work to be done and being realistic, it will take three seasons to get out of this division because this season is already gone. “The best we can hope for is to make the rest of the season as enjoyable as possible for the boys and then convince our best players to stay. “Having assessed the squad over six training sessions, it’s obvious that some experience and quality is required to help the youthful squad develop and mature. 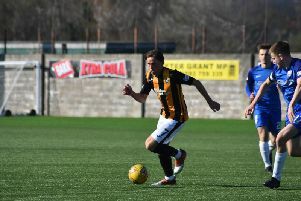 “We will look to try and bring in a couple of players before this Saturday’s home game against Pumpherston. “However, we won’t be rushed as it’s vital that we get not only quality but the right type of character to help nurture the existing very young squad. We’ll look top keep all our best players at the end of this season and recruit wisely in the close season. After a few decades coaching clubs in the Fife amateur ranks, the YM job is Kenny’s first in junior football. “It was big decision,” he said. “We were having the time of our lives at Bayside, and we were absolutely flying at the the top of the league. After two or three seasons of hard work it was a joy to be on touchline. “Then YM chairman Ramsay Budd phoned and said ‘we’re second bottom, no money, and the hut has just been burnt down’ - so I thought that sounds like a good place to go! Their first match in charge is a home league fixture against Pumpherston this Saturday, kick-off 1.45 p.m.